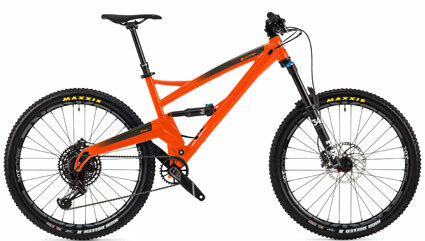 THE ORANGE CONSTANT, TRAIL BIKE BRILLIANCE. 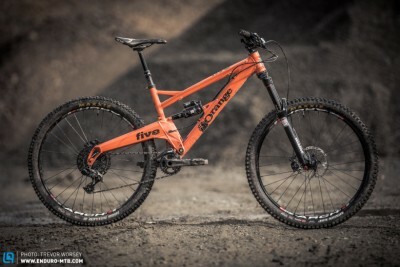 While Orange have a full range of models from 700C urban whippets right through to World Cup downhill monsters, every one with Orange Bikes DNA, there is one bike that many people see as our defining icon; the category defying Orange Five. It is no secret that it is Oranges best selling model, and it wears that crown for a reason. When push comes to shove the Orange Five Pro will step up to the mark in just about any situation. To tip our hats to an old fairytale, it's the Goldilocks bike in our line-up. Not too big, not too small, for people in the know (and even those who are not) it is 'just right'. With this new version, by comparison to the previous incarnations, it's a little longer (10 mm to be precise), a little stiffer (15% to be exact), a little slacker (0.5° to be accurate) but overall it is still undeniably a Five, it always will be. Still 140 mm of travel, still handbuilt in Britain, still single-pivot reliable, still loads of fun out on the trail. The new refinements bring a longer wheelbase, improving climbing capability, reducing the front's urge to lift on steep ascents, and makes an already benchmark descender even more sure-footed and confident. A new lighter shock mount has been designed to improve stress dispersal through the downtube. Not that we had a problem there really, it's always good when we can make things a little better. Built to go anywhere and back. Since Orange launched the first Five over ten years ago they have had a failure rate of just 0.47%. That's not a made up statistic, they checked they're records to be sure. It means the five year warranty Orange provide is rarely called upon. There are three basic model packs available, Five Pro, Five RS and the new Five Factory. Each with a plethora of custom options to built the perfect version for you. What are you waiting for? Orange have not only produced a cult classic with the Five, something that sells well and appeals to a certain market because of image and prestige, but also an anomaly, a freak of nature, something that defies the science we all nerd over these days. If you liked the original Five you will love this! 0% finance available upto 36 months - Apply online, instore or over the phone.